This remote control from Hearth Products Controls was built to accommodate user needs no matter the appliance. The in-line power system features a three-prong in/out specifically designed for safe, reliable outdoor use. 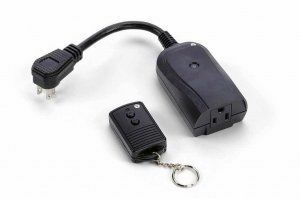 With a working distance of up to twenty feet from the receiver unit, the controller makes an ideal choice for remote control operation of any number of outdoor appliances, providing complete on/off power control capability while remaining simple to install. So make your move today and make your life more convenient! Will this work with an indoor electric fireplace? This will not work with an electric fireplace.